A Large Outdoor Water Feature With Multiple Tiers And LED lights. Stuff Points: Earn 570 points when you buy this stuff. A twisted trunk emerges from the rocky forest floor to perfectly support two antique pots that are resting at just the right angle. The lighted pool below sets the mood as it enhances detail, and adds to the ambiance created by the natural sounds of running water. Although it looks incredibly authentic, this water feature is actually constructed from polyresin, stone powder and fiberglass for a natural look without all the hassle. The color won't fade, weather won't affect it, and the durable material allows it to be light enough to move easily when necessary. Simply fill with water, then plug into any standard outlet, and it will continuously cycle the same water over and over again. Water will pump up the trunk to spill out the side, and from there it will pour down to fill the jar below. Once that jar fills, the water will begin to pour out and fill the lower jar. Once that one reaches capacity, the steady stream will cascade down to fill the large pool at the base. Perfect for any yard, this model sets the mood and enhances existing landscaping. 21" x 19" x 39"
This tall fountain is designed for placement on a floor or other level ground. This fountain uses a combination of polyresin, fiberglass and natural stone powder to give a natural look without being too heavy. 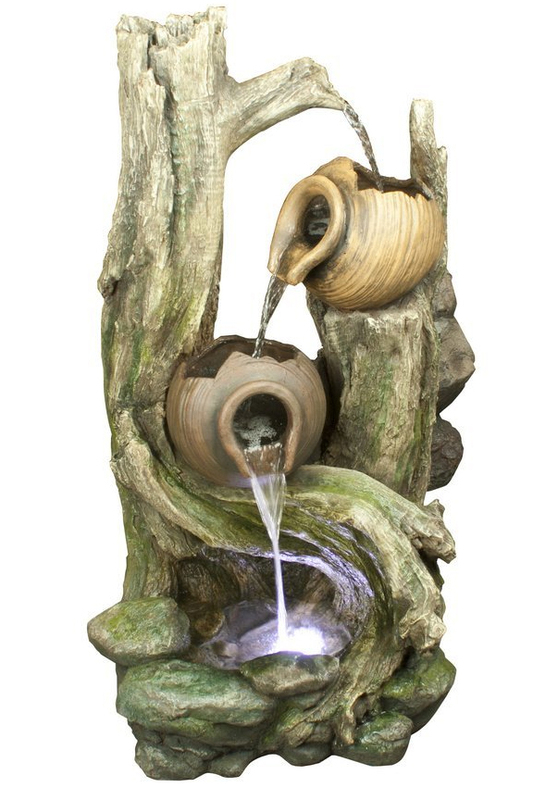 Natural looking wood supports two broken pots to form a tiered fountain that's perfect for any yard. Set a relaxing mood with this high quality water feature. Order Yours Today!